First off they have self serve coffee and tea at the counter, but everything else is full service. We love this because my husband powers through coffee and we often spend our time trying to chase someone down for a refill, plus I like my tea hot and I become high maintenance with asking that they pour out the cold water and add all new hot water. After she showed us where our coffee and tea was she laid down our menu and our order sheet. We must have looked confused because she asked if we had dined there before and we had not. Because this place is a small plates, tapas kind of place you order lots of small plates. 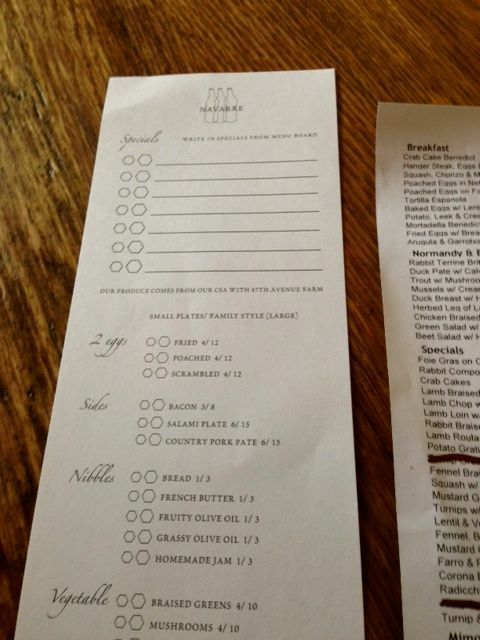 You go through the menu and you mark down everything you want. I loved this because I am a visual girl and I like to see how much stuff we have ordered instead of trying to keep track of it in my mind. She gave us a few suggestions and then we began our own search of items. 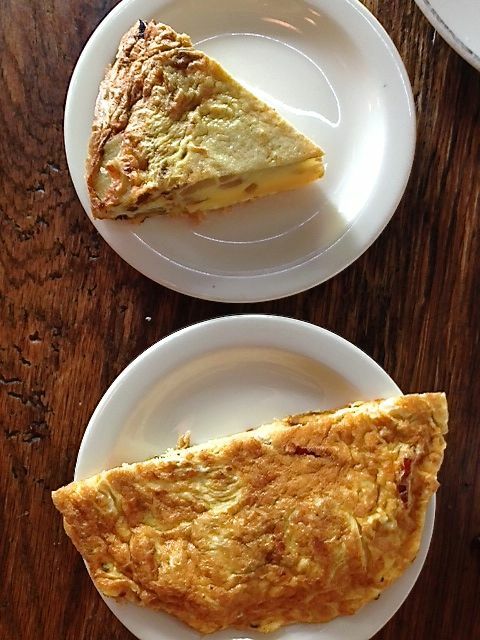 Tortilla Espanola. It had great flavor but was served cold. I didn’t love that. As it became more room temperature I liked it better. Squash and Chorizo Frittata. This item was a nice size and flavored really well. You must love squash for this dish and I do, so we enjoyed it. 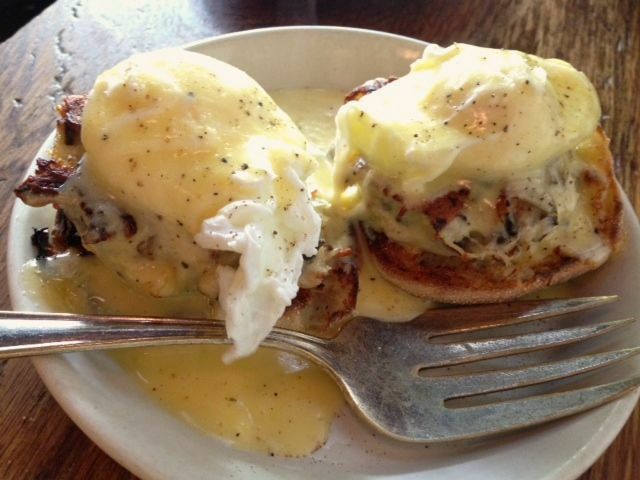 Of course an eggs benedict and we chose the Crab Cake Bennies, (this is why this place was on my list). My husband even loved this dish and he rarely shares my bennies. It was loaded with crab, they did not skimp at all. It’s also worth noting that the hollandaise sauce was surprisingly light, yet they did not lose flavor by doing this. I think this may have been why my husband enjoyed these so much. Plus being that I was still on crutches and not able to work it off, it made me feel better about eating it. Who am I kidding, I would have eaten it either way…I ate the bread after all. She told us not to miss the Potato Terrine. This was like creamy, heavenly potatoes. I didn’t take a picture, because they were not much to look at, but the flavor was stupendous. 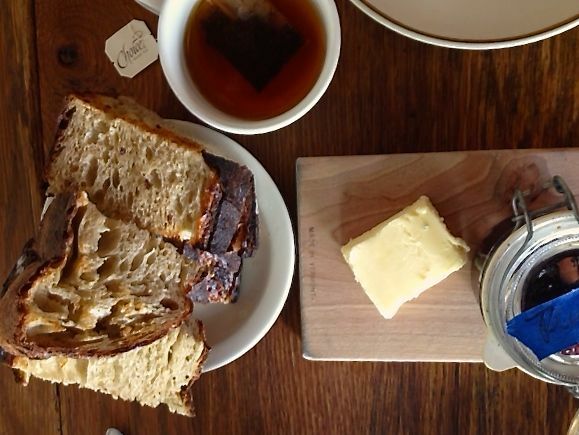 When my husband came with our warm coffee and tea he also admitted he ordered some great looking bread. One of the down sides to self serve coffee and tea I guess. This really was a great way to start the meal. HUGE chunks of bread with yummy jam. We had Plum jam our neighbors next to us had strawberry and she asked if we minded swapping. Don’t worry, this was after a few pleasant exchanges over our meal and sharing was great! I do have to say, for those of you that like your sweet treats for breakfast, this place did not have sweet treats. I prefer a savory breakfast, so it was perfect for me. I loved the way you ordered and can’t wait to go back for dinner and share a meal with friends. Lots of friends. Atmosphere was really cool. It’s a smaller space, kind of dark, but we sat towards the window. It had a great feel about it. Service was good. She was helpful and very pleasant. Pricing was $5-$10 on items for sharing. I thought the $10 for crab cake bennies was a great price. If you haven’t guessed already we loved the self serve tea and coffee. Navarre is located off of NE 28th Ave and Burnside. I am pretty sure they didn’t, because it was more like plain crab not a crab cake(even though they called them crab cakes). But you might want to ask just to be sure. Oh my gosh. I’m somewhat obsessed with squash so that frittata sounds awesome. 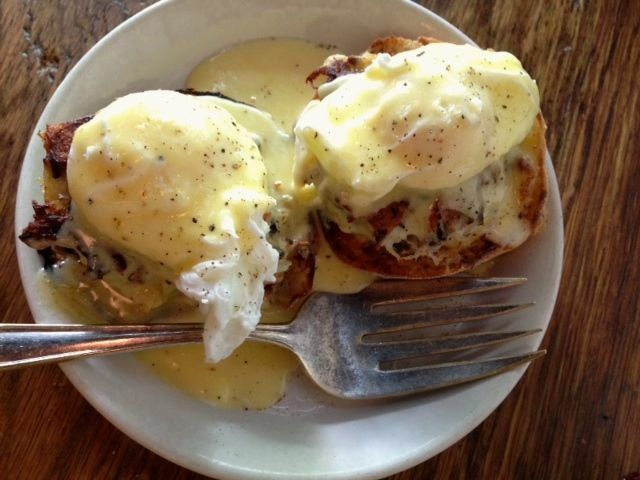 But so does that crab benedict. What a genius idea. I am for sure adding this to my brunch list. Looks AMAZING! Are the lines long? There were no lines. It was busy the whole time though.